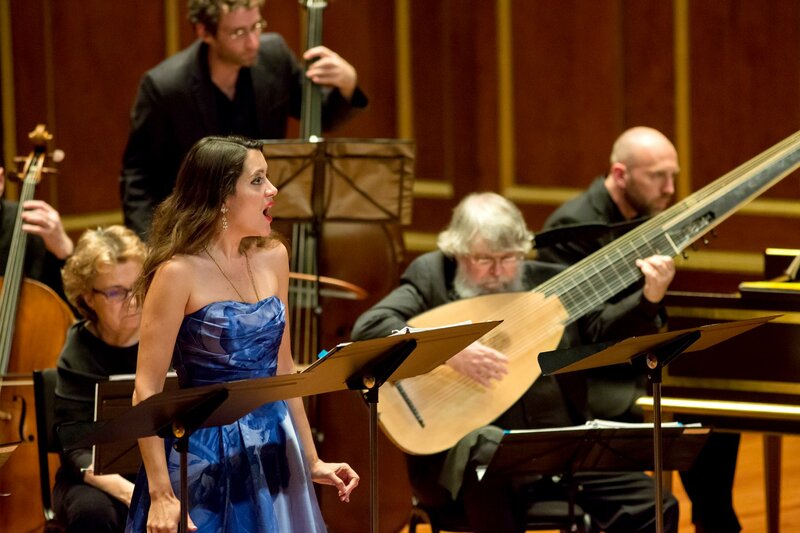 Boston Early Music Festival presented Handel’s very first opera, Almira, in concert Saturday night and Sunday afternoon at Jordan Hall. Handel scholar Ellen Harris’s informal but most informative pre-concert lecture gave this listener the necessary mental infrastructure to survive the opera’s weak libretto, whose dramatic arc involved political intrigue, amorous misunderstandings, star-crossed lovers and royal ambition at the Spanish court, not to mention the ill-advised attraction between the Queen and one of her servants (of obscure birth, but who [of course,] turned out to be of royal blood) the exotic appearance of an African prince, the comic relief of a nosy servant, and sexual harassment (heavens!) by an old courtier who couldn’t keep his hands off a young ingénue who, in the end, married his son. But the music saved the day. 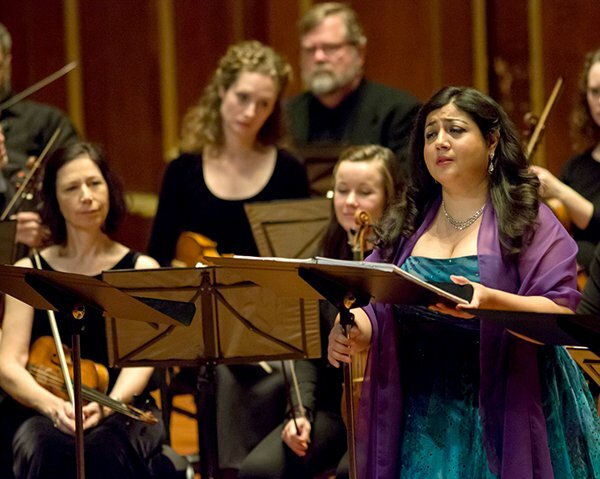 Wonderful arias (rage, jealousy, love, doubt) and a fascinating web of recitatives and ariosos blended into one another, avoiding the rather more tedious alternation of aria and recitative of Handel’s later operas. The fact that many of the arias were not da capo form (which involve repetition of substantial segments of music) added to the pleasing variety. As always, the success in these operas depends on the performances, which were generally stellar here. It fascinated me to hear a few of the arias in Almira as earlier versions of the arias from his Roman oratorios, particularly his Il Trionfo del Tempo e del Disinganno (The Triumph of Time and Truth). He specifically molded them to the situations and texts in each case. Given the bewildering variety of sources, BEMF’s performed from its own edition. Among the several cuts—no doubt because of the sheer length of the opera—I sorely missed hearing the original instrumental version of the aria Lascia la Spina (also known as Lascia ch’io pianga, in another opera). Handel recycled many of his arias and instrumental movements throughout his life, but he usually reworked and transformed them. The original Italian libretto for Almira was translated into German for the 18th-century premiere, but several arias were originally left in the original Italian and that’s how BEMF presented the work. English supertitles made the story line clear in all its absurdity. One came away appreciating the more cogent libretti used by Monteverdi, Purcell and Mozart. But one also came away with a new appreciation of Handel’s youthful genius. Kudos to all the solo singers: Sherezade Panthaki, Amanda Forsythe, Colin Balzer, Christian Immler, Zachary Wilder, Jesse Blumberg, Teresa Wakim, and Jan Kobow. A couple of these were ill, but you would not have known it. The colorful, conductorless orchestra, shining as one of the real stars of the evening, played wonderfully under the shifting leadership of Robert Mealy, Paul O’Dette and Stephen Stubbs. I enjoyed the solo contributions of harpist Maxine Eilander, oboist Gonzalo Ruiz, recorderists Ruiz and Kathryn Montoya, and violinists Mealy and Julie Andrijeski. The large string section executed with assuredness and dedication, as did the invigorating continuo team of cellist Phoebe Carrai, gambist Erin Headley, harpsichordist Michael Sponseller, the expert 16-foot ministrations of Douglas Balliett on bass — agile, in tune and shapely, and of course O’Dette and Stubbs, BEMF’s courageous musical directors. Daniel Stepner is Artistic Director, The Aston Magna Festival and Foundation. This is a wonderful review and, in my view, very accurate. It should be noted that Dan Stepner took on the duty after the original, assigned reviewer became ill enough to be hospitalized, and he issued it in record tine. Whoops! I neglected to mention the expert 16-foot ministrations of Douglas Balliett on bass — agile, in tune and shapely. Many thanks, Dan,for your expansive and informative review, and especially for writing it on such short notice.